An example of a rain shadow. 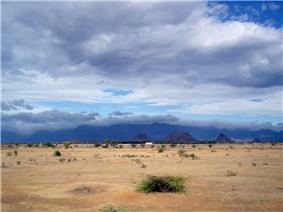 A rain shadow is a dry area on the lee side of a mountainous area (away from the wind). The mountains block the passage of rain-producing weather systems and cast a "shadow" of dryness behind them. 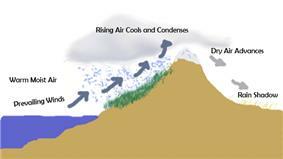 As shown by the diagram, the incoming warm and moist air is drawn by the prevailing winds towards the top of the mountains, where it condenses and precipitates before it crosses the top. The air, without much moisture left, advances behind the mountains creating a drier side called the "rain shadow". The Judean Desert and the Dead Sea are rain shadowed by the Judean Hills. Eastern Side of Sahyadri ranges on Deccan e.g. Northern Karnataka & Solapur, Beed, Osmanabad and Vidharba Plateau of India. The Atacama Desert in Chile is the driest non-polar desert on Earth because it is blocked from moisture on both sides (because the Andes Mountains to the east blocks moist Amazon basin air and high pressure over the Pacific and cold ocean currents keeps rain from coming in from the west). The Argentinian wine region of Mendoza is almost completely dependent on irrigation, using water drawn from the many rivers that drain glacial ice from the Andes. The nearby Chilean wine region of Valle Central on the other hand, is situated on the Chilean side of the Andes and experiences a maritime climate. Cuyo and Eastern Patagonia is rain shadowed from the prevailing westerly winds by the Andes range and is arid. The aridity of the lands next to eastern piedmont of the Andes decreases to the south due to a decrease in the height of the Andes with the concequence that the Patagonian Desert develop more fully at the Atlantic coast contributing to shaping the climatic pattern known as the Arid Diagonal. The aptly named Death Valley in the United States, behind both the Pacific Coast Ranges of California and the Sierra Nevada range, is the driest place in North America and one of the driest places on the planet. This is also due to its location well below sea level which tends to cause high pressure and dry conditions to dominate due to the greater weight of the atmosphere above. The Shenandoah Valley of Virginia, wedged between the Appalachian Mountains and the Blue Ridge Mountains and partially shielded from moisture from the west and southeast, is much drier than the very humid remainder of Virginia and the American Southeast. On the islands of Hispaniola, Cuba and Jamaica, the southwestern sides are in the rain shadow of the trade winds and can receive as little as 400 millimetres (16 in) per year as against over 2,000 millimetres (79 in) on the northeastern, windward sides and over 5,000 millimetres (200 in) over some highland areas. The windward side of the island of Madagascar, which sees easterly on-shore winds, is wet tropical, while the western and southern sides of the island lie in the rain shadow of the central highlands and are home to thorn forests and deserts. The same is true for the island of Réunion. ^ "How mountains influence rainfall patterns". ^ Glossary of Meteorology (2009). "Westerlies". American Meteorological Society. Retrieved 2009-04-15. ^ Sue Ferguson (2001-09-07). "Climatology of the Interior Columbia River Basin" (PDF). Interior Columbia Basin Ecosystem Management Project. Retrieved 2009-09-12.